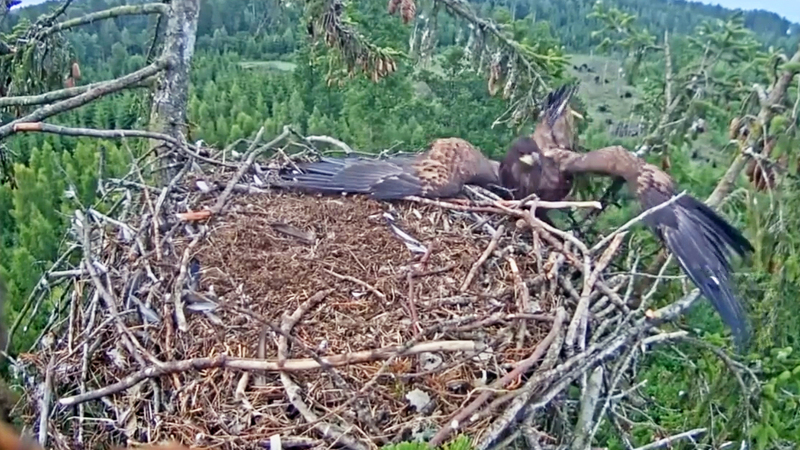 Eagle crash lands into nest, on The Feed! Some of the latest and greatest viral videos include an eagle flubbing her nest landing on a live webcam and a surfer on fire. MSanmaelo posted this video of a golden eagle, pulling off a less-than-smooth landing at her home base. The massive bird gets tripped up by a branch, and then simply sits there, contemplating -- seemingly knowing that it all went down on a live webcam for the world to see. But, after she's done processing the shame, the proud predator props up on her perch. Jamie O'Brien achieves one of his greatest ambitions in this video from Red Bull. The professional surfer takes on the legendary giant wave of Tahiti -- Teahupo'o -- while lit on fire! Jamie dons a thermal setup, two wetsuits and a hoodie to withstand the heat. He describes the feat as the "best, craziest adrenaline rush" of his life.